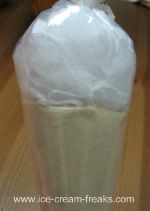 Want to make some homemade ice cream gifts for the ice cream lovers in your family? Here I'll share my ideas and directions for making them. They are fairly inexpensive and make great Christmas gifts. Of course, you can use them as presents for other occasions too. If you know someone who gets excited about ice cream novelties,these gifts won't disappoint. Click on a link below for directions. Do You Have An Original Idea Or Creation To Use As Ice Cream Gifts? 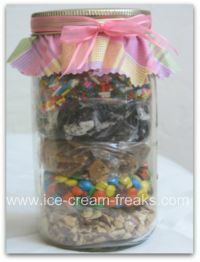 Do you have an ice cream gift idea or creation to share with other ice-cream-freaks visitors? We would love to know what it is. Please include pictures and instructions with your creations. 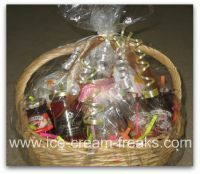 Your ice cream gifts ideas will appear on a Web page exactly the way you enter it here. You can wrap a word in square brackets to make it appear bold. 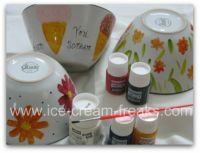 For example [my ice cream gift ideas] would show as my ice cream gift ideas on the Web page containing your ice cream gift ideas. 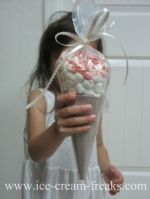 Check out the cute ice cream cone Christmas ornaments that was posted on Craftblog.com in Austrailia. There are instructions for making them.